On this date in 1522, the leader of the Revolt of the Brotherhood came to his grief in Valencia. Spain circa 1519-1520 was a powder keg. The rival kingdoms Aragon and Castille had of late been joined by a personal union of Ferdinand and Isabella, but now that couple was several years dead, and the scepter held by an irritating Flemish youth who had just popped in to hike everyone’s taxes so he could fund the bribe campaign necessary to become the Holy Roman Emperor Charles V.
This was more than fine by the salty Valencia townsfolk, who much detested the overweening aristocracy. 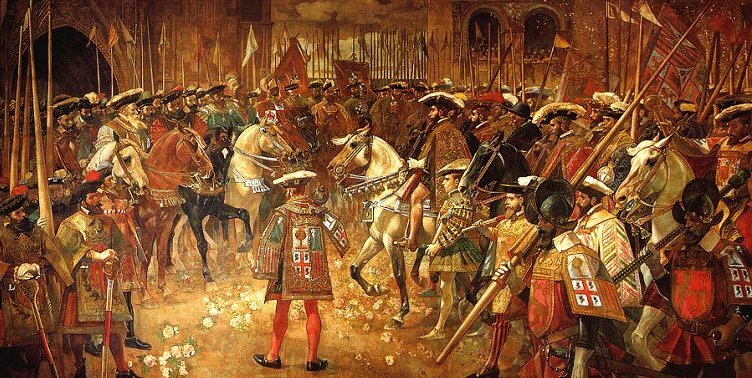 A “Council of Thirteen” — one representative from each of Valencia’s principal guilds — took over the city’s government. La pau de les Germanies (The Peace of the Germanias) by Marcelino de Unceta. Vicente Peris (English Wikipedia entry | Spanish), a firebrand weaver, soon came to be the first among this leading baker’s dozen. He enjoyed some military successes in 1521, and took advantage of them wherever possible to impose forced conversions, property expropriation, or summary execution on any Muslims he could lay hands upon. No surprise but this alarming situation drove the hated caballeros into organized counterattack, just as the Valencian factions started breaking apart over how far to push the revolution. After they were thrashed at the Battle of Oriola in August 1521, they didn’t have to worry about that question any more. Peris was caught slipping back into now-royalist-controlled Valencia on February 18, 1522, apparently hoping to stir up his old comrades in arms once more, and caught only after a running street battle that night that ended with him being smoked out of his house as it was burned around him. As addenda to his execution this date, that house was entirely razed and the ground salted over, with a decree that nothing should ever be built there again. Peris’s descendants were anathematized as traitors to the fourth generation. * The island of Mallorca followed Valencia’s lead in revolt, and by 1523, followed its unhappy fate as well.